Take a look at this year’s line up for Council Rock’s Raising Great Kids Speaker Series. This year’s RGK series incorporates film and discussion for two of the presentations for parents/teens to start the conversation around cyberbullying and teen anxiety. 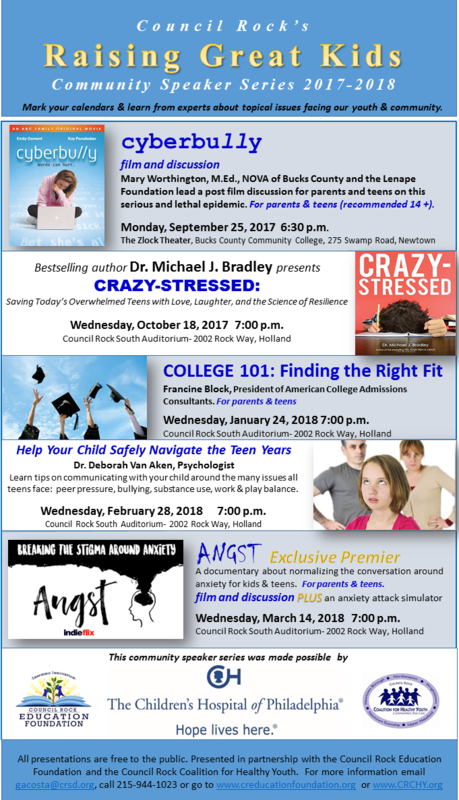 In October, bestselling author Dr. Michael J. Bradley delivers CRAZY-STRESSED for adults –saving today’s overwhelmed teens with love, laughter and the science of resilience. In January, parents and teens are encouraged to attend together our COLLEGE 101 presentation to plan for higher education. In February, Dr. Van Aken will share communication tools that parents, care givers and educators can use to help our children stay safe and healthy. Each year our RGK committee solicits feedback from our attending parents about our presentations along with surveying about areas of concerns which aids in the creation of the next RGK speaker series. Our most recent results indicated concerns in the areas of stress management, parent-child communication skills, substance use, cyberbully and college planning. The RGK speaker series is free to our community and is made possible by the Children’s Hospital of Philadelphia. The series is a collaborative effort by the CREF and CRCHY.